We’ve all heard the saying “when it rains, it pours” and when you’re going through a divorce that’s often the way it feels. Personally, when I was going through my divorce it seemed like there were times when it was just one thing after another. 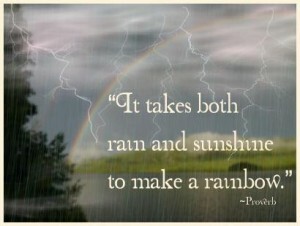 I had to keep reminding myself that if I wanted to see the beautiful rainbow I had to endure the rain. After the storm the sun would come back out and just like magic there would be a rainbow. Hard as it may be, try to look at things in a positive light during this trying time in your life. This entry was posted in Divorce and tagged Moving on, survive and thrive. Bookmark the permalink.